??? : It's Garp, the "hero"! Inazuma: The bridge is.... falling!! 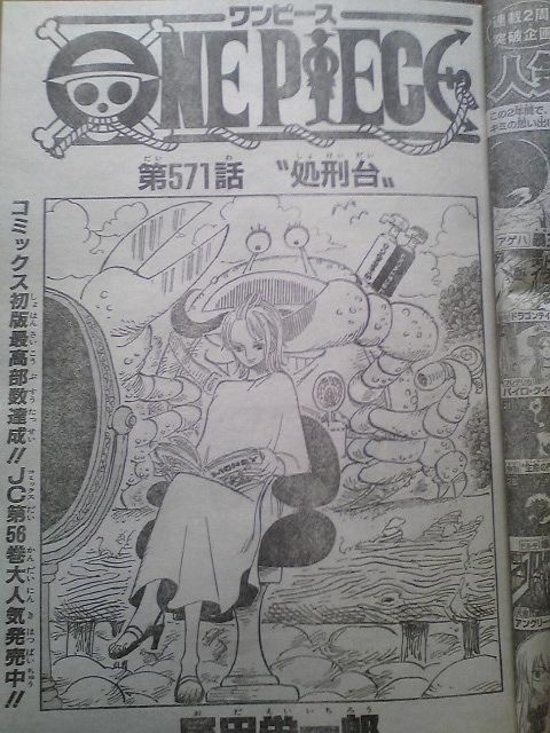 Ivankov: Do something about it, Strawhat boy!! 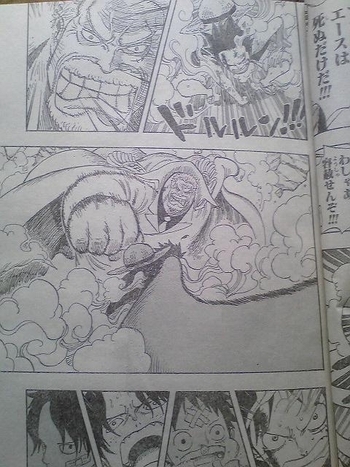 Garp: I've been fighting pirates long before you were born!! Luffy: I can't do that Grampa, please get out of my way!!! 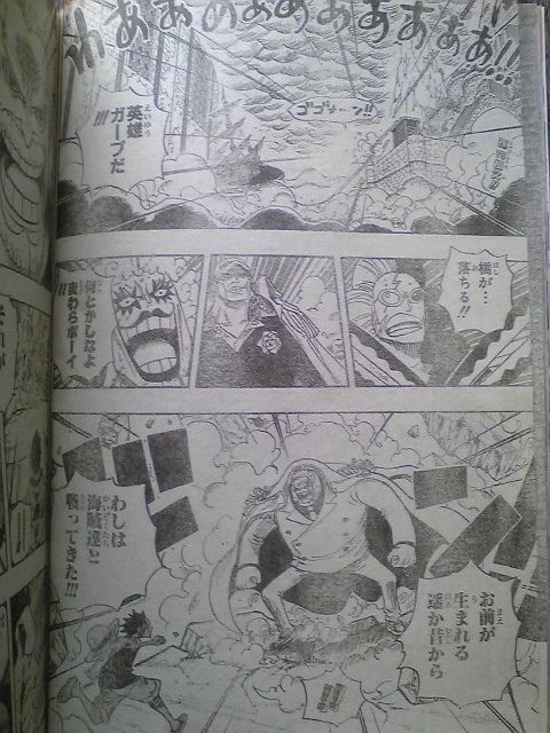 Garp: If you can't, then it means Ace dies!!! Luffy: No, I don't want to!!! Garp: Many unwanted things happen in the world, despite your wishes!!! I won't go easy on you!!! Garp: Luffy... I declare you an enemy of mine!!! Ace (flashback): After all this... I now value my own life!! 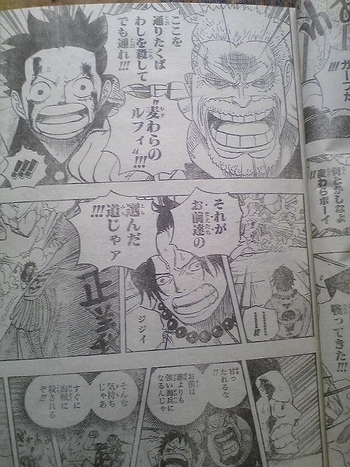 Sengoku: You're still a parent afterall, Garp...!! Hancock (flashback): Take this... it's the key to your brother's cuffs! 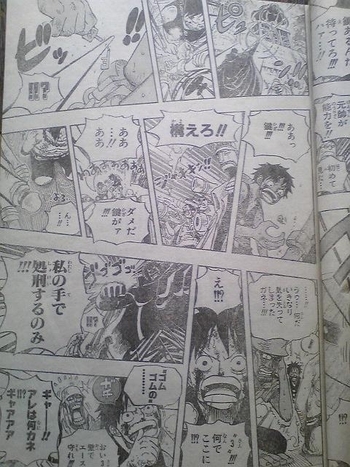 Luffy: Hang in there for a sec, I have the keys!! 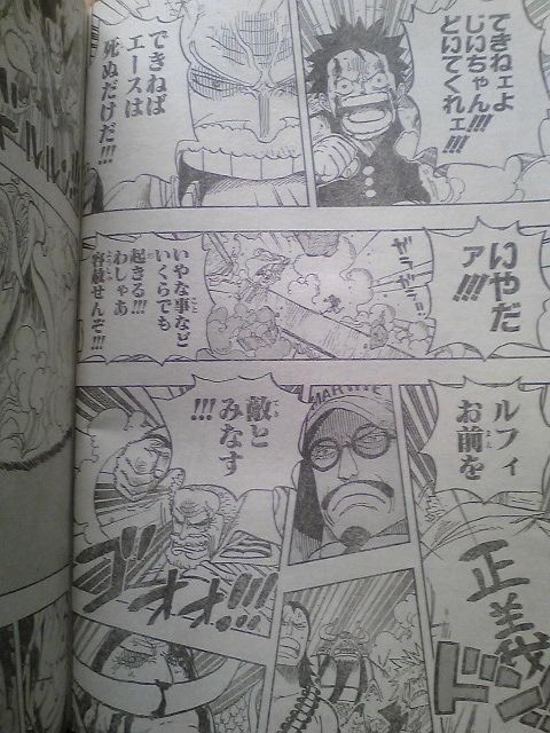 Marine A: Look, Fleet Admiral Sengoku is using his ability!! Marine B: This is the first time I've seen it!! Sengoku: Wait!! Don't you think I'll let you off!!! Luffy: Aaaahhh!!! No, the key!! Mr3: ...!! What was that... I suddenly lost my conciousness....!! Luffy: What the!? "3"!!! What are you doing here!!? Sengoku: I'll execute you by my own hands!!! Mr3: GYAAAAA!!!! WHAT THE HELL IS THAT THING!!?? GYAAAAAAA!!!! 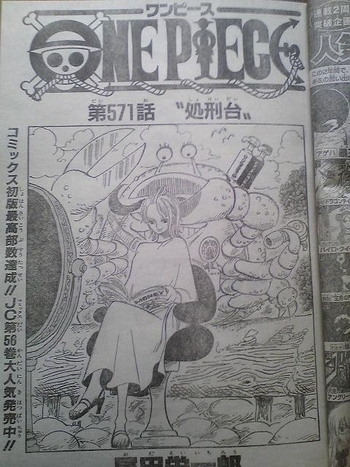 Sengoku: He can grow large!!? Marine: The execution stand is falling!! Pirate? : What just happened!? Ace isn't dead yet!! Mr3: I'll make the key!! I'll get those cuffs off right away!! Marines: Shoot them!!! Blow them away along with the stand!!! Bon-chan (flashback): Make sure and save your brother!!! Mr3: If I told you the reason I'm here... is to fulfill my fallen comrade's wishes... would you laugh at me? Luffy: I course I wouldn't!!! 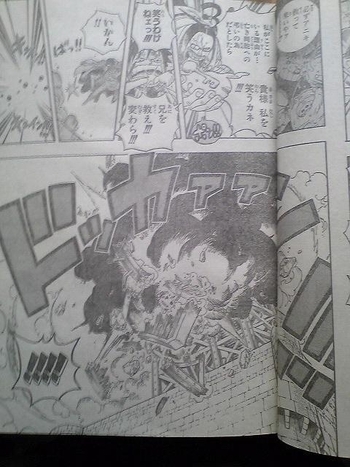 Mr3: Save your brother, Strawhat!!! Whew, now give me all your cookies. I'll leave it up to some other mod to edit the first post. He's in it for Bon-chan! Hell yeah, give that man a medal. Marine: Firefist is in his solid form, he can't possibly be alive!! Marine: huh!? There's a tunnel of flames in the explosion!! 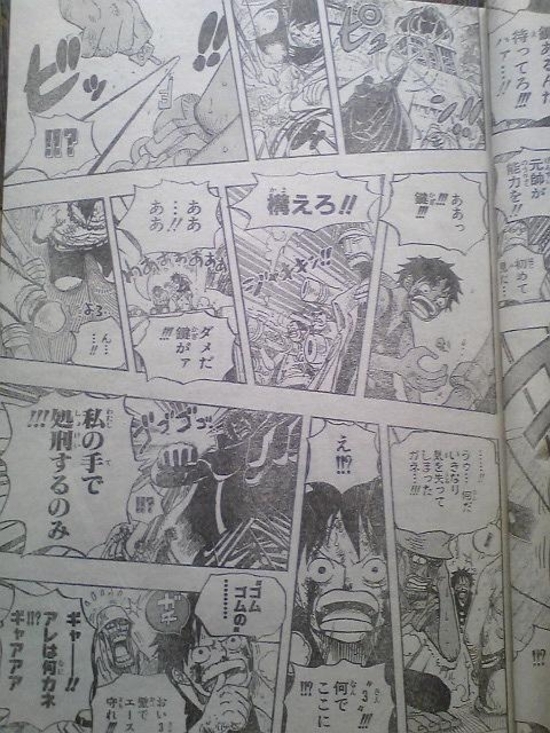 Ace: You're always like that, Luffy!! You never listen to what I say... and dash in headstrong! !